Do Journalists Tolerate Hated Ideas? One of the most cherished principles in American journalism is the notion that unpopular and even hated ideas deserve First Amendment protection and fair-handed treatment from journalists. But has this principle always existed, and how are hated ideas treated during times of crisis, such as war? 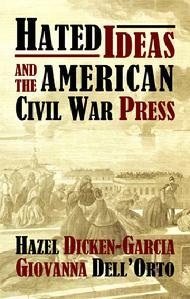 In this book, media historians Hazel Dicken-Garcia and Giovanna Dell�Orto search for some of the answers by analyzing newspaper coverage of hated ideas � such as abolitionism and slavery � during the American Civil War. They found that the Civil War strengthened the idea of journalism�s responsibility to the public; editors often had eloquent free speech discussions; and opposition presses were sometimes defended. However, the data also showed that tolerance was the exception rather than the rule. "[E]ditors consistently supported the larger political system over any professional journalism ideology, the �common good� over individual rights, and military �discretion� over constitutional principles," the authors write. The authors conclude that "although the editors� intolerance makes their statements about the Constitution ... seem hollow, it must be remembered that they were in the midst of a highly abnormal national crisis. ... [T]he Civil War experience underscores the fact that marginalized ideas across history have persisted, often to become accepted as part of mainstream culture. Despite intolerance by journalists ... of certain ideas ... the First Amendment has continued to sustain civil liberties ... ."
Hazel Dicken-Garcia (Ph.D. University of Wisconsin) is a professor of journalism and mass communication at the University of Minnesota. She is author of Journalistic Standards in Nineteenth-Century America, which received the Kappa Tau Alpha Best Book Award in 1990. She received the Sidney Kobre Award, given by the American Journalism Historians Association for contributions to journalism history in 2006. Giovanna Dell'Orto (Ph.D. University of Minnesota) has been studying 19th- century journalists' interpretation of free speech rights for more than 10 years. Her first book, Giving Meanings to the World, explored how the first U.S. newspaper foreign correspondents created images of the world for readers. She grew up in Italy and now lives in the United States.